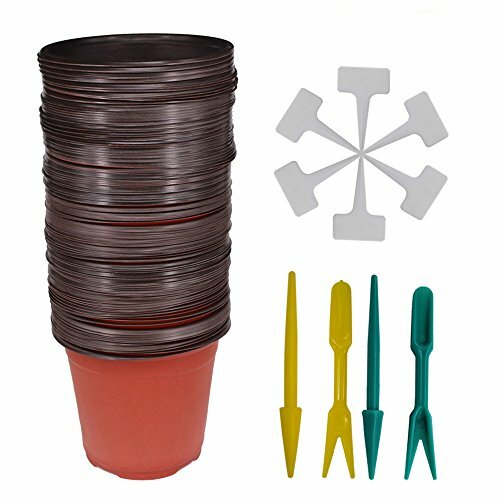 Seedlings Plants Nursery Pots are made of soft thin plastic, lightweight and reusable. Which is lightweight, reusable and restored after being compressed with no broken. T-Type Plant Tags are made of tough plastic, easy to write and complete UV resistant with a matte finish. The transplant tool set is made of hard plastic, and it is easy to use. The Plastic Seedlings Plants Nursery Pots keep soil drained and ventilated. Waterproof Plastic T-Type Tags are helpful to recognize what and where the plant is. Reinforced tip easy to placed into hard soil. And the Transplant Tool Set is perfect useful to transfer your plant to the right place. The whole product set is economical and well-equipped, perfect for plant seed starting and small potted plants cultivation. This is a good choice for gardeners! Package Included: 80 Pcs 6 inch Seedlings Plants Nursery Pots, come with 80 Pcs Waterproof Plastic T-Type Tags and 2Pcs/Set Transplanting Digging Mini Tools as bonus. Material: soft thin plastic. Which is lightweight, reusable and restored after being compressed with no broken. Special Design: 8 small drain holes in these pot bottom can help soil drained and ventilated; and the top raised rim make they are easy to handle and to stack. T-Type Plant Tags are made of tough plastic, easy to write and complete UV resistant with a matte finish. And The transplant tool set is perfect for transfer your plant to the right place. Economical and well-equipped, perfect for plant seed starting and small potted plants cultivation.